Abstract: With prior research indicating successful college media programs, as judged against their peers, tend to be housed in academic departments with faculty-level advisors, this study examines how college media outlets are presented, promoted, and used for recruiting within departments and home institutions. How visible are they? Primarily housed in political science, visibility has expanded as a research interest with the advent of social media. For this study, visibility is “organizational behavior to present content communally” (Brunner and Boyer 2008). After examining the top 35 award-winning programs, results indicate low levels not only of presence and visibility, but also self-promotion: college media references are two clicks from department homepage (46%) and 3-4 clicks from university homepage (57%). Media outlets most often post recruitment information (33%). These results suggest a need for growth in promotion, public relations, and associations. Introduction: College media is an area of active interest for communication scholars as college campuses are viewed as testing grounds for methods of content production and audience integration. Recent research into college media has examined practices related to content management systems (Brockman, Bergland, and Hon 2011), social media usage and policies (Filak 2014), crisis coverage (Heath and Blanton 2015), comparison of online vs. print editions (Bergland and Hon 2009), and overall newsroom operations (Kopenhaver 2015). Other scholars address regional technology adoption (Payne 2013), digital approaches to interviewing, newsroom sociology, analysis of content, legal issues, and more. While practices or policies relating to print and digital production or presence are very important, the visibility of student media is seldom studied. How do the university and department present or even acknowledge student media? How visible is student media? Much of college media visibility can be tied to its home institution. While editorial independence dictates college media are not a public relations tool for academic institutions, the media groups would be wise to take advantage of their home institution’s public relations tools to garner visibility on their campus. While building promotion and digital visibility into staff responsibilities, the rotating nature of a student staff suggests when college media groups maintain academic or curriculum relationships, much of the visibility should take place at the department level. This relationship would allow for recruitment support and recognition through the department’s public relations efforts, e.g., Web sites, social media, and departmental press releases to the university and community media sources, creating a mutually beneficial digital visibility of college media. For some media groups, it’s a struggle to obtain links on a homepage or as part of a department or curriculum-based program. Others are listed in less-than-prominent spots in a dropdown menu or gallery of buttons along the side of a department page, along with all “opportunities” or “options” for student experience or engagement. With prior research indicating the most successful campus media programs, as judged against their peers, are housed in academic departments with advisors who have faculty status (Terracina-Hartman and Nulph 2013; Kopenhaver 2015) this study examines these top institutions and academic departments for the level of visibility of their college media groups. With today’s college students labeled a “dreamer generation” (Diddi and LaRose 2006) and highly likely to seek information online rather than in promotional brochures or catalogs for their academic research, a virtual presence “at home” becomes critical to visibility. Theoretical Background: Various opportunities exist throughout the academic year for institutions to highlight college media as options for student journalists to practice their craft in a learning lab-type setting. Other opportunities exist to hold up these media organizations as recruiting tools for potential students considering Mass Communication & Journalism as a major as well as applicants, visitors, and recruits to campus who might be drawn to an institution that offers such hands-on opportunities no matter the intended major. After conference and awards season each spring semester, another opportunity exists for an institution and department to publicly acknowledge college media groups and promote them as worthy organizations to join as well as acknowledging the student members for being department leaders for these journalistic accomplishments. Awards from national conferences also give the institution and department the opportunity to highlight the relevance and stature of their program and the level of student work on the national stage. Yet are they doing so? When a physics team wins a science tournament or a robotics team wins awards at a state fair, it appears a common practice for academic institutions to celebrate this accomplishment with a feature article on a university home page, the department page, and in press releases sent to area media as well as relevant hometown papers. Is the same being done for college media? As many college media groups tend to be curriculum-affiliated (Terracina-Hartman and Nulph, 2013; Kopenhaver 2015), it is logical to expect such success would be similarly promoted. In short, with academic departments housing programs that build upon curriculum with real-world opportunities, it would be expected that such options would be valued and highly visible among the department literature, home pages, and perhaps the university home pages. Links to student radio, newspaper, magazine, and television stations would be front and center on the home pages of the department and the division, and the university itself. Media build communities and anyone considering attending a university could find out most information about the campus, its citizens, and its activities from college media. Additionally, college media programs often are magnets for touring speakers, accomplished alumni (especially journalists) and professionals-in-residence for short courses. Such events also would give a host institution added impetus to promote and highlight college media. Departments that host speakers and guest professionals-in-residence routinely are in the spotlight for such special events. Is the same being done for college media? Literature Review: A review of current literature reveals a shortage of research on college media and relationships to home institutions aside from funding agreements. Nonetheless, some studies have been selected that bring to light several variables. An online presence, or visibility, is essential for any academic or curriculum-based student organization (see e.g., Park and Reber 2008; Poock and Lefond 2001). Portability has leaped to new levels, which according to Diddi & LaRose (2006) makes today’s college students a true “Internet generation” (p. 197). The students entering university or studying during this age of development in digital communication tools and technology are more likely to research information about their education, whether it is an academic program or a class schedule, on the Internet (Pew Research Center 2011). Althaus and Tewksbury (2000) report that the Internet is woven into the fabric of the college experience when it comes to seeking and finding information (but not necessarily related to homework assignments). Historically housed in the political science arena in which scholars linked visibility to presence and measured physical appearances to citizen response, visibility is considered both as a characteristic of an organization and as characteristic of an issue. How and whether a person appeared at an event, whether it was a scheduled news or social event, or post-crisis, such as weather or terrorism, for example offers one option to measure visibility based upon presence and the citizen responses to these appearances. With the advent and growth of communications media tools, visibility has expanded as a research interest. While visibility once had the primary goal of positioning and power-seeking through presence, recent research has linked this concept with public relations, branding, and relationship-building – essentially organizational dynamics. With new technology, communication has more options for two-way discourse, thus visibility becomes as much about association as it does about presence (Yang and Kent 2014). For the purposes of this study, visibility is defined with respect to use of digital technology: “[visibility] uses organizational behavior to present content communally” (Brunner and Boyer 2008, p. 152). A definition of presence is “parties are communicating in a shared space (or place)” (Anderson 1994). With advances in Internet and social media communication tools, relations between university and students have altered. These tools offer new options to spread information and a new way to engage students – from visitors and potential recruits, to new enrollees, to enrolled students, to graduates and alumni (Lovari and Giglietto 2012). University Web sites become strategic communication tools in the higher education arena. For example, Abrahamson (2000) reported that prospective students who view a university’s Web site as inadequate will regard this electronic experience as reflective of the university’s overall functioning. When it comes to future students and computers, the 2010 Social Media and College Admissions Study by Cappex found that college search sites, Twitter, and Facebook are among the most common digital approaches for recruiting and impressing students (Education Insider, 2010). A Pew Research Study found that 92% of young adults aged 18-24 are Internet users, while nearly 100% undergraduate and graduate students report Internet use (Smith, Rainie, and Zickuhr 2011). Hussar and Bailey reported National Council on Education Statistics showing the number of high school graduates nationally is predicted to rise 15% from 2006–2017 while the total enrollment of degree-granting institutions is predicted to increase 16% (2008). Much mediated communication research has examined the role of digital environments in higher education (Aquilani and Lovari 2009, 2010); Ellison, Steinfeld & Lampe 2007; Griffith & Liyange 2008; Hewitt & Forte 2009). Will and Callison (2006) analyzed the Web pages of 3,738 universities for content and approach, finding that the target audience is donors first, then alumni, and then current students and potential recruits. The content subsequently reflected this target demographic. Applying Kent & Taylor’s dialogic principles for the Web (1998), Gordon and Berhow (2009) examined university Web pages, selecting 232 of those listed on U.S. News & World Report’s “America’s Best Colleges” in 2006 for their sample. The authors conclude that despite the variance in educational offerings and approaches, universities were surprisingly similar in adoption of digital features. Overall, the authors rated the sites high on providing information, particularly liberal arts colleges as compared to national, doctoral-level universities but less strong on dialogic principles, such as live chats or encouraging return visits with offerings of updated information. Additionally, study results show a small correlation between dialogic features and student retention rates (r = 0.146, p < 0.05). In short, the authors conclude that the university Web sites tended toward one-way communication: while “advanced technology tools like chats, blogs, portals, instant messaging, podcasts, and RSS feeds are increasingly common features on the World Wide Web, universities have yet to fully realize the potential of such features in the prospective student recruitment process” (p. 152). Recent research found that university Web sites with dialogic features generated the most applicants and most return visitors (McCallister-Spooner 2010). The author concluded that this level of communication served students who considered institutional programs and faculty before location when selecting a college to attend; thus, level of information was critical to attracting and serving potential recruits. This result supports earlier research (e.g., Abrahamson 2000) which found Web presence second only to college visits. One of the only studies to survey adult students about specific experiences seeking information on higher education web sites, concludes the sites “come up short with respect to content” (Eduventures 2007). The survey questioned students how useful they found the Web sites on searches for specific information: 63% reported finding the information they sought. But in a usability study, McCallister-Spooner (2008), found that even being unable to find more than half of the information sought, participants did not express strong opinions in favor of or against the sites. Survey participants did report negative feelings with regard to the lack of dialogic options (McCallister-Spooner 2008). Method: To define a study sample of student media programs that have exhibited success at the national level based upon student media competitions, the present study examined results from five years of national-level student media competitions, including Associated Collegiate Press, College Media Association, College Broadcasters, Inc., Broadcast Education Association, and Society of Professional Journalists. These organizations were chosen based upon the depth of their national student media competitions and to provide a fair balance between broadcast, online, and print media. Analyzing five years of data from these competitions produced 144 institutions with at least two wins at the national level. The data was then sorted for total number of awards with greater weight given to those with fewer competitions due to the possibility that the same work was able to win a national award at multiple competitions. Then the data was sorted for first-place awards, then second, and then third, and honorable mentions. 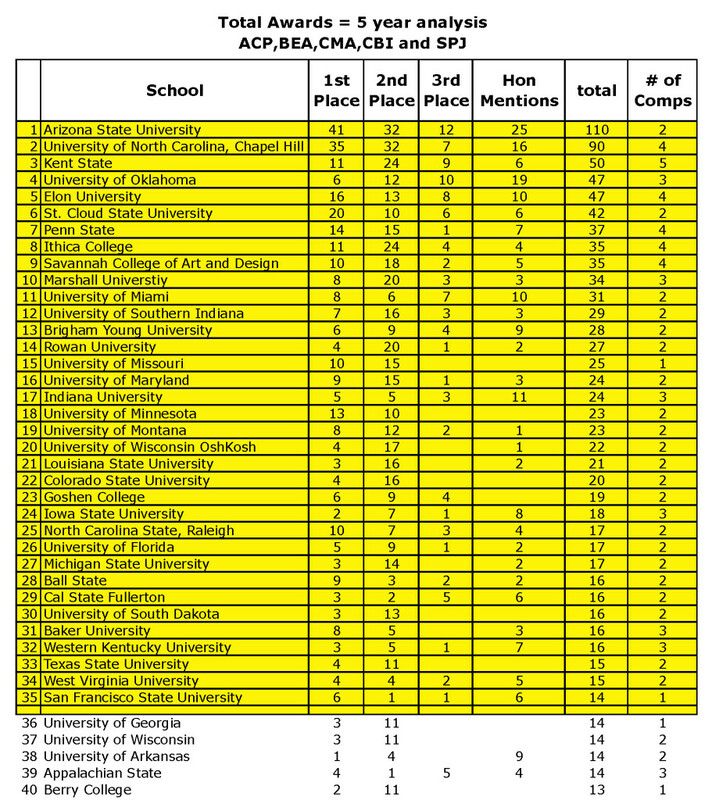 The resultant sort identified the top 35 programs across these various student media groups (Table 1). Using this information, a visibility measure was created to examine several variables, including university promotion, department promotion, award praise, recruitment, honors, and presence. 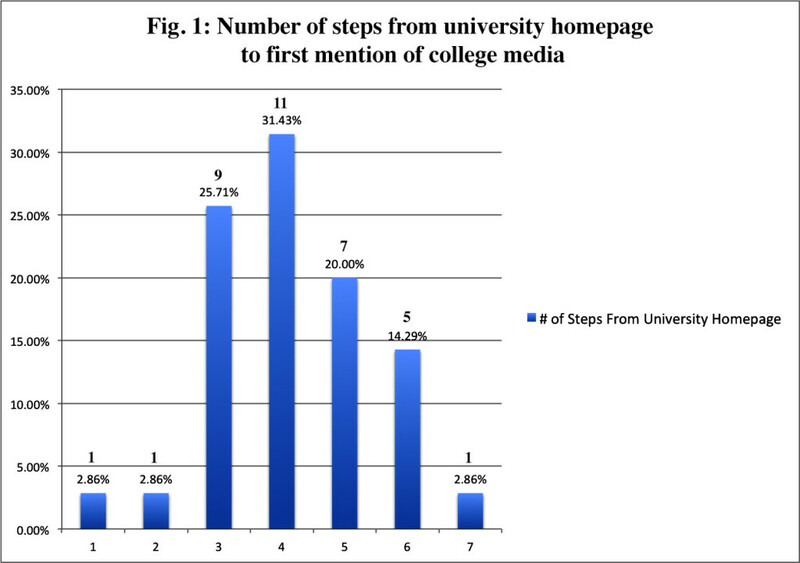 This study operationalized visibility with two measures: counting the number of clicks to reach college media from homepage and the number of clicks to reach a college media outlet from a department page. Coders also logged the route they took to reach college media (followed “academics” link or used “search” window). Measurement included mention in department description, announcement of awards, description of history, presence on campus or recent innovations. Five coders, plus one author, conducted a pilot test using a sample of five university home pages with at least five college media outlets. Training in teams of two was continued as coders reported some difficulty with names of Community Relations offices at some university campuses. To allow for the possibility of chance agreement, a reliability test was conducted, achieving an average score of .82. Three coders then coded the entire sample of 35 colleges. The coding scheme is available in the coding protocol in Appendix A.
RQ1: How visible is college media on a college homepage? RQ2: How visible is college media on a department homepage? RQ3: Do differences exist in how various student media outlets are presented? Results: RQ1 asked how visible a college media outlet is on a university homepage. 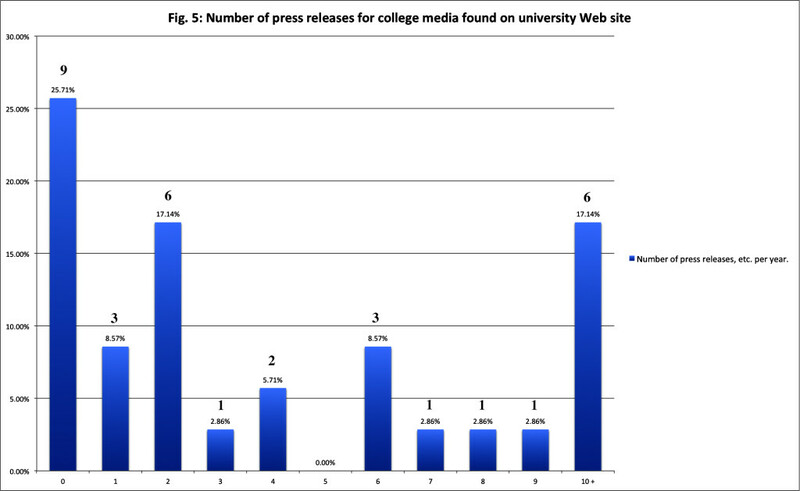 Of the 35 university homepages examined (Table 1) coders searched for all references to college media outlets identified in participation in national college media contests. Results indicate the most common response as 3 steps (26%) to 4 (31%) to find college media at one of the top-ranked institutions (Fig. 1). 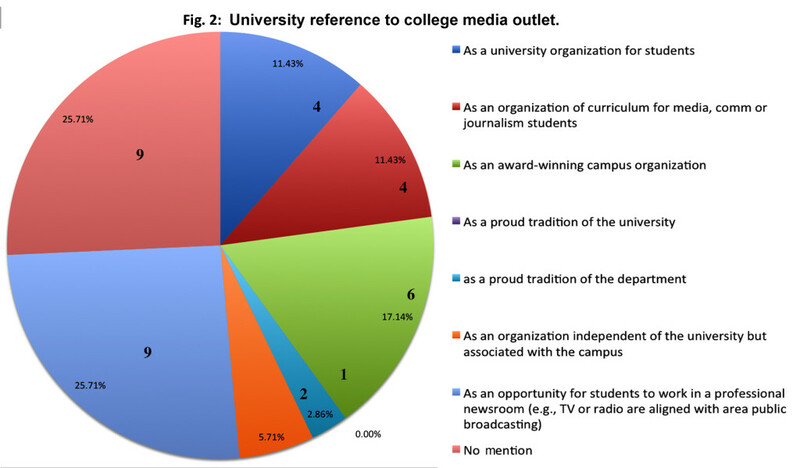 Additionally, coders were asked to identify how college media outlets were identified in the initial references on their home institution main pages (Fig 2). The most common reference identified was “as opportunity for students to work in a professional newsroom setting” (26%) followed by “as award-winning organization” (17%). RQ2 asked how visible a college media outlet is on a department homepage, given that many are associated with curriculum and housed in academic departments. Fig. 3 shows nearly half of college media programs in the dataset (16) were visible from a department homepage in just two steps. To further answer RQ2, finding information about college media outlets (or links to them) appeared very straightforward: a link to the college newspaper from the department homepage by name was visible 22% of the time while 78% of departments linked to college media (more than one) through their department homepages. 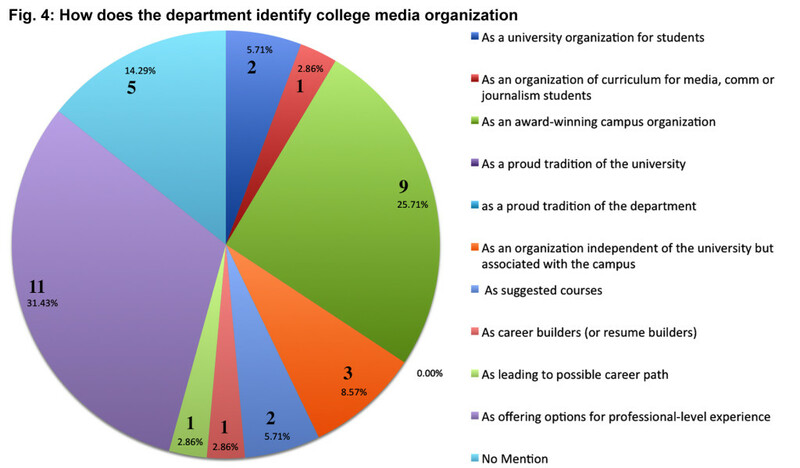 References to these college media outlets tended to reference them as options for professional-level experience (31%), followed by “award-winning organization” (26%) (Fig. 4), which is slightly higher than the results found for university referent. Lastly, RQ3 asked whether the various media outlets at any university might be treated or presented differently. This question is an opportunity to investigate how various funding sources and associations a college or university might have for its college media outlets could influence visibility. For example, college broadcast stations require greater funding streams for equipment and licensing; thus student fees or even affiliation with Student Life or Marketing establish a different relationship than a college newspaper or college magazine (Terracina-Hartman and Nulph 2013). Coders did not find this to be the case; 34 of 35 colleges appeared to present their college media with similar levels of visibility. The last variable in the present study measured the content of the references to college media whether on the university homepage or a department homepage. Possible mentions include recruitment, class meetings, contact information, awards earned, guest or special lectures, and more. Results (Fig. 3 and 4) indicate the most frequent reference on both college home pages and department home pages is an opportunity for students to work in a professional-level setting. A dropdown menu is a popular option, but rarely is a link to student leaders presented, meeting times, or relevant coursework and advisor information posted. Coders also followed the links to college media themselves to determine how much of this information was contained in their own communication with the campus community. Results, presented in Fig. 6, indicate that recruitment information consistently is a primary information post found among most college media outlets. Information about awards or honors or other events was minimally present. Lastly, to verify whether success was associated with visibility at home, cross tabs and chi square tests of association were conducted for programs in which the result was reaching college media in four steps or less. A significant interaction was found (x2(1) = 11.219, P < .05). Discussion: The goal of this research study was to ascertain to what level visibility was associated with college media and their home institutions, particularly among the top award winners in national level competition. What these results show can offer great direction to advisers and their home departments who hope to help their student journalists as they promote visibility as an organization value and thus, integrate visibility into work responsibilities and routines. Visibility, as an organizational value, may contribute to structure and stability. In conducting this study, several expectations were present: 1) the coders would be able to locate the university’s primary URL quickly and be able to ascertain the names of college media quite easily and precisely. Neither of these things happened. The coders expressed such frustration that a “virtual map” was prepared for coders, identifying the home pages of each academic institution, the names of the relevant departments, and the names of each award-winning college media group and at least one way to reach these virtual places. Coders were encouraged to use any option available on the protocol or develop their own. This need, therefore, revealed critical distances between college media and their home departments and institutions, particularly as the media selected for this study are among the most award-winning in the past five years. The association between the top programs and the present study’s definition of visibility suggests a small level of value at “home”; however, the best method to confirm academic value of student accomplishment would be to compare with other such group events, such as robotics team awards, marketing team competition, and others. Clearly, visibility could and should have a clear relationship to marketing and recruitment (Poock and Lefond 2001). For institutions and departments, the question is: would four clicks be acceptable to potential applicants seeking to learn about college media as they are preparing to apply for college? These results align with prior research (Filak 2004): while it may be several semesters before curriculum addresses social media strategy and management in the journalism sequence, for example, but student journalists would be best served to begin viewing social media platforms as a tool in the news production process to maintain their presence and visibility with their audience. 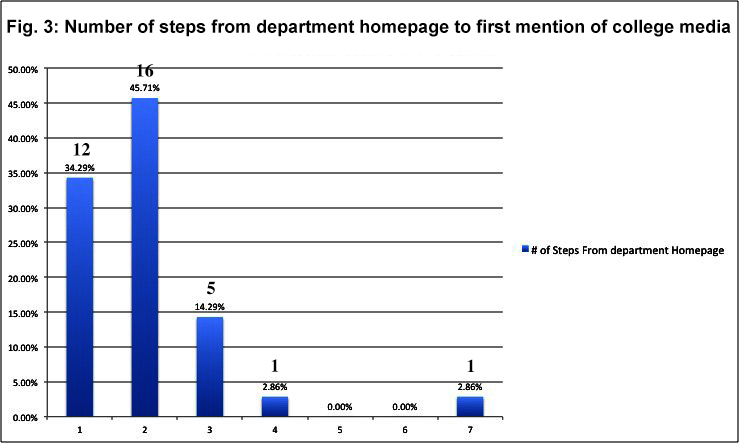 The interaction between reaching college media in four steps or less from a department homepage and these successful programs suggests visibility is one area where advisers might direct efforts to support their student editors toward integrating these tasks. This study has several limitations, not the least of which can also be a strength. Defining visibility as steps or a route to finding content about organizations for future students who will only expand their use of digital research suggests that organizations not only need to be present but with high visibility; maintaining one single path to information may not be sufficient. To that end, coders who went straight to a “Search” window as opposed to the “Academics” link on the home page reported more frustration that typing in names of a top newspaper or award-winning TV program did not lead them where they wanted to go. Similarly, tests of association suggest all coders traveled the same steps en route to their virtual location. Such is a weakness of coding methods that risk self-report bias. That leads to a second limitation: coders were instructed to report the first items they saw in the first mention of college media; however, that location could offer much information, including relevant curriculum, social media links, and event announcements. So, it must be reiterated that choices were not mutually exclusive. Future: While this study was an outgrowth of prior research (Terracina-Hartman and Nulph 2013), so too should this research continue to expand. A future study could add a separate calculation to measure social media presence (Twitter, Facebook, and Instagram posts) to examine how and when the institution links to college media. Other research indicates most college media uses hosting systems separate from their institutions; yet standards and branding must be followed to either associate or separate the two entities. (Brockman, Bergland, and Hon 2011). 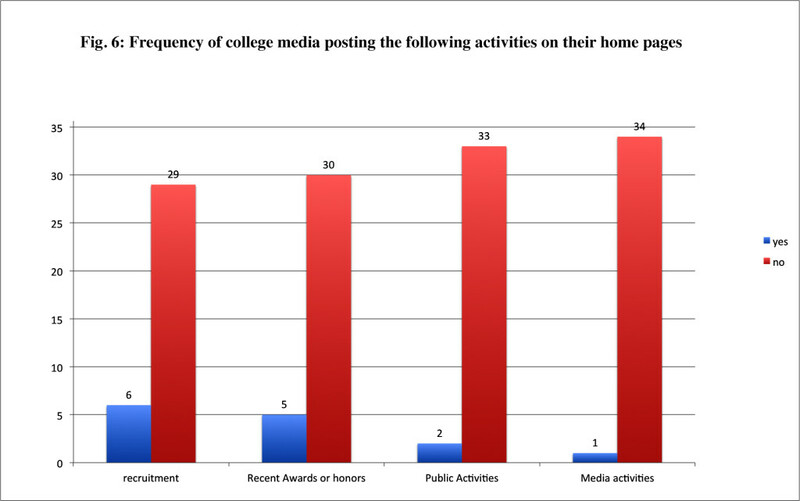 College media likely use social media to promote their news coverage during university events (sporting events, lecture series, commencement) (Filak 2014). Yet a review of not only this relationship, but the reverse – does the university tweet about a guest lecturer to a newspaper production class? – could reveal helpful information about features that are successful, need adjusting, or should be implemented. Lastly, repeating the analysis using a random sample of college media rather than top award winners could offer a broad spectrum of relationships between college journalists and their “home” institutions. Abrahamson, T. (2000). Life and death on the Internet: To Web or not to Web is no longer the question. The Journal of College Admissions, 68, 6–11. Althaus, S., and Tewksbury, D. (2000). Patterns of Internet and traditional news media use in a networked community. Political Communication. 17, (1), 21–45. Anderson, R. (1994). Anonymity, presence, and the dialogical self in a technological culture, in: R. Anderson, K.N. Cissna, R.C. Arnett (Eds. ), The Reach of Dialogue: Confirmation, Voice, and Community, Hampton Press, Cresskill, NJ, pp. 91–110. Aquilani, B., and Lovari, A. (2009). Social networks and university communication: Is Facebook a new opportunity? An Italian exploratory study. International QMOD and Toulon-Verona Conference on Quality and Service Sciences (ICQSS), (1-15). August 27-29, Verona. Aquilani, B., and Lovari, A. (2010). University communication mix and the role of social network sites: Is direct presence of the college really desired by students? Facultade de Economia da Universidade de Coimbra (Eds. ), Proceedings of the 13th Toulon-Verona Conference on Quality and Service Sciences (ICQSS), (252-266). 2nd-4th Settiembre, Coimbra. Bergland, R., Hon, D. Noe, S. and Hartigan, K. (2008). Interactivity and Multimedia on College Newspaper Websites. Paper presented at National College Media Convention, Kansas City, MO. Nov. 1. Bergland, R. & Hon, D. (2009). College Newspapers and The Myth of Convergence. Association for Education in Journalism and Mass Communication conference, Boston, MA, Aug. 5, 2009. Brockman, C., Bergland, B., & Hon, D. (2011). Research spotlight: Top student news Web sites share multimedia, interactive features. College Media Review, 49 (1). DeAndrea, D., Ellison, N., LaRose, R., Steinfield, C. & Fiore, A. (2012). Serious social media: On the use of social media for improving students’ adjustment to college, The Internet and Higher Education, 15, (1), 15-23. Diddi, A, & LaRose, R. (2006). Getting hooked on news: Uses and gratifications and the formation of news habits among college students in an Internet environment. Journal of Broadcasting & Electronic Media, 50, (2), 193–210. Eduventures, (2007). Optimizing school Web sites as a marketing and recruitment tool. Boston, MA: Eduventures. Ellison, N., Steinfeld, C. & Lampe, C. (2007). The benefits of Facebook “friends:” social capital and college students’ use of online social networking sites. Journal of Computer-Mediated Communication, 12, (3), 1143-1168. Filak, V. (2014). Sender-receiver, receiver-sender: A uses-and-gratifications study of student journalists’ use of social media. College Media Review Research Annual 51, (1), 4-16. Gordon, J. & Behow, S. (2009). University Web sites and dialogic features for building relationships with potential students. Public Relations Review, 35, 150–152. Griffith, S., & Liyange, L. (2008). An introduction to the potential of social networking sites in education. Proceedings of Emerging Technologies Conference, University of Madrid, November 14-16. Heath, J., & Blanton, B. (2015). The Most Difficult Story: Covering Suicide on College Campuses. College Media Review Research Annual, 52, (1), 4-14. Hussar, W.J., & Bailey, T.M. (2008). Projections of Education Statistics to 2017 (NCES 2008-078). Center for Education Statistics, Institute of Education Sciences, U.S. Department of Education, Washington, D.C. Retrieved May 11, 2015. http://nces.ed.gov/pubs2008/2008078.pdf. Kent, M.L., & Taylor, M. (1998). Building a dialogic relationship through the World Wide Web. Public Relations Review, 24, 321-340. Kent, M.L.,& Taylor, M. (2002). Toward a dialogic theory of public relations. Public Relations Review, 28, 21-37. Lodge Kopenhaver, L. (2015). College Student Media Advisers Fare Well: Faring Well in Uncertain Times. College Media Review, 51, (1), 43-49. Lodge Kopenhaver, L. (2009). 2009 Study of Advisers Shows Improvements, Causes for Concern. College Media Review, 47, (3), 23-29. McCallister-Spooner, S.M. (2010). Whose site is it anyway? Expectations of college Web sites. Public Relations Journal, 4, (2). McAllister-Spooner, S. M. (2008). User perceptions of dialogic public relations tactics via the Internet. Public Relations Journal, 2 (1). Meyer, K.A., & Jones, S. (2011). Information Found and Not Found: What University Web Sites Tell Students. Online Journal of Distance Learning Administration, 14, (3), Fall. Park, H., & Reber, B. (2008). Relationship building and the use of Web sites: How Fortune 500 corporations use their Web sites to build relationships. Public Relations Review, 34, 409-411. Payne, L.L. (2011-13). Black and White and Still Red All Over: Examination of the State of College Newspapers in a Turbulent Time. College Media Review Research Annual 49&50 (1), 18-25. Poock, C.M., & Lefond, D. (2001). How college-bound prospects perceive university Web sites: findings, implications, and turning browsers into applicants. C&U Journal, 77 (1), 15–21. Smith, A., Rainie, L., & Zickuhr, K. (2011). College students and technology. Pew Internet and American Life Project. Retrieved from http://www.pewinternet.org/Reports.2011/College-students-and-technology/Report.aspx. Terracina-Hartman, C. M., & Nulph, R.G. (2013). Campus Media Advisers: Is there a doctor in the newsroom?” College Media Review, 51, (1), 16–31. Will, E.M., & Callison, C. (2006). Web presence of universities: Is higher education sending the right message online? Public Relations Review, 32, 180–183. Yang, A., & Kent, M. (2014). Social media and organizational visibility: A sample of Fortune 500 corporations. Public Relations Review, 40, (3), 562–564. Introduction: This paper seeks to define and develop a typology of visibility within a college media context. While visibility has not been an active area of research, college media visibility among its home institution can prove to be a useful construct to measure. This study’s findings suggest visibility may contribute to organizational structure and stability. Operational Definitions: The unit of measure is the home institution’s Web page and available links. 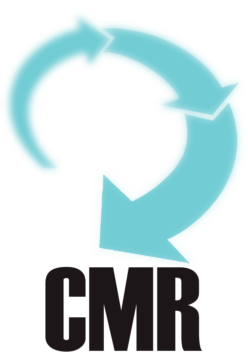 Coders will investigate how visible the individual campus media operation is from the home page, the department page, the faculty advisor bio (if applicable), and the campus press office. Information sought includes options for participation; history; organization; mentions of recruitment events; enrollment in associated courses or co-curricular programs; awards; activities, such as conferences, open houses, tutoring labs). There is a lack of theory in organizational visibility pertaining to a home institution when an element of independence dominates the relationship, as is the case with university and college media relationships; thus, we offer a theoretical model of visibility, offering seven steps of generalized visibility. Were a potential student journalist to look for information on a specific program at a specific university, how many steps would it take? Considering organizational visibility literature, which has strong ties to public relations, would this level of visibility indicate overall respect for the attributes, achievements, and offerings of college media? Indicate the department’s faculty page. Find the faculty advisor for the media organization. Does this page link the faculty member to the media organization? Does the faculty advisor’s page link to the college media organization? Find the college media’s homepage or newspage. Do you find evidence of? 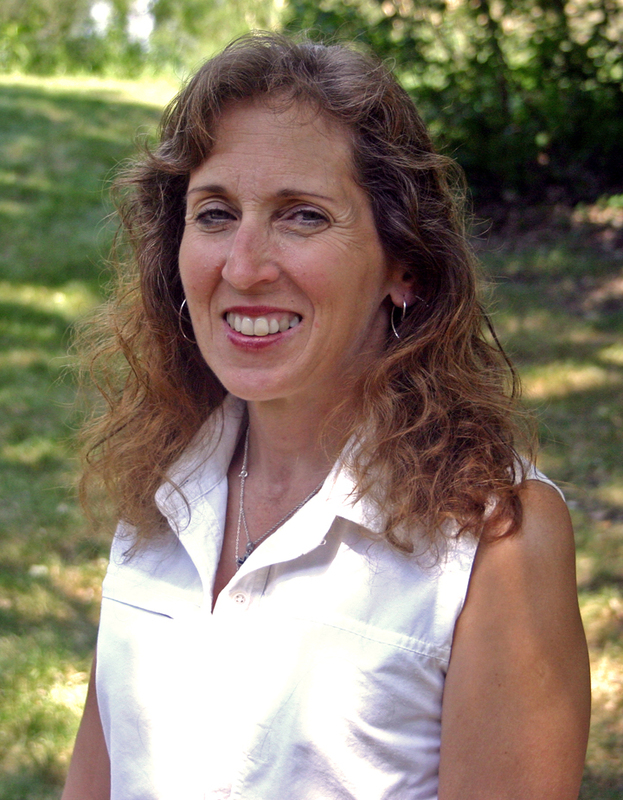 Dr. Carol Terracina-Hartman is faculty adviser of The Royal Purple student newspaper and teaches in the Broadcast / Print / Web sequence at the University of Wisconsin-Whitewater. She also maintains a freelance writing, editing and producing business, focusing on all topics environmental. Robert G. Nulph teaches convergent journalism at Missouri Western State University and specializes in anything with a lens. 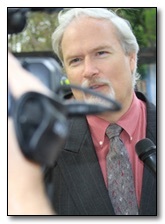 He is also an independent video/film producer/ director and photographer.